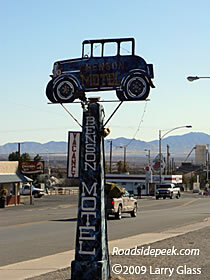 Featuring quite an interesting marquee, the Benson Motel in where else but Benson, AZ is still open for business along the main route through town. 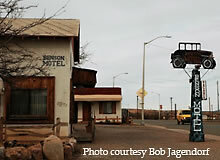 This is one of the first motels in the US, built in the 1920's. The sixteen rooms have carports right next to them and is still being used today. Here's the marquee for the Thunderbird Motel in Show Low, AZ. This marquee still stands tall along the main drag through town after being built in 1961. 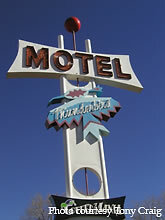 The thunderbird image that's on the marquee itself features the typical colors and shape of other namesake motels. Another of the Miracle Mile motels, the Amazon Motel still stands tall. The sign which lights up in neon appears to date back from the 1950's or 60's. This sign directs tired travelers towards the Tombstone Motel. Check out the slogan, Rest In Peace, fitting for the town that is famous for the Gunfight at the OK Corral. 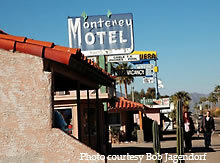 Catch a glimpse of the Monterey Motel in Tucson, with a desert theme befitting the area its located in. The motel was originally named the Monterey Court and dates back to the late 1930's before changing names to the Monterey Motel in the early 1940's.